NOTICE: The PNL-GFDI-80 series ground fault breakers that are included in many prewired load centers and FP systems are NOT rated for use on circuits shared with an FM100-300VDC! The FM100-300VDC charge controller is equipped with an internal ground-fault protection device and simply requires 300-VDC rated overcurrent protection on its input and output circuits. 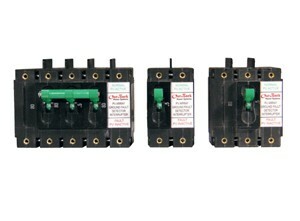 The PNL-100/125-300VDC series breakers are recommended for the battery side and the PNL-40/60/80-300VDC series breakers are recommended for the PV array side. Due to the different voltage ratings, OutBack Power does not recommend mixing the FM100-300VDC with the FM60 or FM80-150VDC controllers on the same battery bank. Be sure to thoroughly review installation instructions when installing OutBack Power equipment.